All the convent sisters continue to work on preparations for Spirit of America Band’s participation in the Dubai workshops at the end of this month. Whether or not they play an instrument or are even going on the trip themselves every sister is very involved and supportive of the endeavor in whatever way they are able to contribute. Last week the emphasis was on sewing. All who could helped with the job of fitting, altering and adjusting each uniform. This week when the participants from all over the country come together for rehearsal, we will be feeding about 200 people for the entire weekend; so much help will be needed in Paraclete House Kitchen. One of the meals that has hit the spot with most of the group and received a lot of praise is this hearty beef stew that not only provides them with needed energy but also satisfies their taste buds in a special way. Place in a 5- to 6-quart slow cooker. Add half of beef to skillet; cook, turning to brown on all sides, about 8 minutes. Heat oil in large skillet over medium-high. Repeat procedure with remaining beef. Add wine to skillet; scrape to loosen browned bits from bottom of pan. Bring wine to a boil, and cook 1 minute. Stir in tomato paste, salt, pepper, carrots, garlic, celery, onions, and 2 cups beef stock. Add thyme sprigs and bay leaves. Cover and cook on LOW until beef is tender, 7 1/2 to 8 hours. Whisk together flour and remaining 1/2 cup stock. Add flour mixture and to slow cooker. Increase heat to HIGH; cover and cook until bubbly and thickened, about 5 minutes. Discard thyme sprigs and bay leaves. Saturdays in the Community call for a lot of physical participation, especially for our band members — 20 of which are sisters. Morning Beehive, the weekly time when all Community members gather to work together on whatever jobs need most to be done, starts at 8 am and continues until noon, with a half hour coffee break at 10 am. Following lunch our convent band sisters pack up and take off with the rest of the band for a full afternoon of serious rehearsal often requiring considerable concentration as well as physical activity. Everyone knows that when the band comes home they will come home very hungry and be looking forward to a substantial dinner. That’s why we always plan a hearty meal for that evening for all of us. Pat the ribs dry and sprinkle with salt and pepper. Heat 2 tablespoons of the oil in a Dutch oven over medium-high heat and brown the ribs on all sides, working in batches if needed. Remove the ribs and set aside. Add the remaining 1 tablespoon of oil to the Dutch oven and reduce the heat to medium. Add the carrots, celery, onions and some salt and pepper and cook until soft, about 5 minutes. Add the garlic and cook until fragrant, about 1 minute. Add the tomato paste and cook, stirring, to remove the raw flavor, about 3 minutes. Deglaze the pan with the vinegar and wine, and then add the red pepper flakes and bay leaves. Add the ribs back to the pan and add enough stock to reach halfway up the sides of the ribs. Bring the pan to a simmer, cover and place in the oven. Braise until the meat is tender, about 1 1/2 hours. During the last half hour, uncover to allow the liquid to reduce and the pork to brown. Remove ½ of the veggies and blend to a thick puree- return to pan juices to thicken the sauce. Serve the ribs with Creamy Polenta, spooning the sauce on top, and garnishing with parsley. Spray the insert of a slow cooker with cooking spray (for easier clean up) and preheat on high. In a medium saucepan, add 1 cup of the half-and-half, the milk, 1 tablespoon of the butter and the polenta. Season with salt and bring to a boil over medium-high heat, whisking constantly to keep the mixture lump-free. Boil for 2 to 3 minutes. Pour the mixture into the slow cooker and cook on high for 2 hours, stirring once or twice per hour. Once you are ready to serve, open the slow cooker and whisk in the remaining 1 tablespoon butter, the remaining 1/3 cup half-and-half and the Parmesan. Salt and pepper conservatively since the polenta will be served with a robustly salted dish. Spring on the Cape is at its peak this week, with trees budding, boats going back into the water, gardens being cultivated, summer cottages being opened and the pungent smell of salt water filling the air. Clamming licenses are being renewed, and fishermen are painting and repairing their boats – it’s an exciting time to live on Cape Cod! 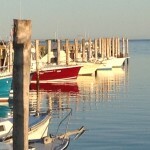 The beauty and stillness that I found as I walked along the harbor boardwalk yesterday was palpable. “It’s time to make chowder”, I thought to myself. 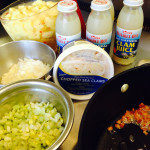 A visit to Cape Cod just isn’t complete without a steaming bowl of chowder. If you can’t get to the beach this summer, try this recipe to bring the beach to you! Place the salt pork or bacon in a heavy 5 quart sauce pan and set over medium heat. Cook, stirring occasionally, until the bacon is brown and crisp (don’t burn!). Remove the bacon bits w/ a slotted spoon and reserve. Add the onion, celery, bay leaf and thyme to the drippings and sauté until they are wilted and golden. Add the flour and cook for about 1 minute, then add the potatoes and clam juice (both the bottle juice and the liquid reserved from the clams). Set the kettle over medium high heat and bring to a rapid simmer, then reduce the heat and cook for 15-20 min until the potatoes are tender. Remove the bay leaf. Stir in the cream and heat, uncovered, without allowing the mixture to boil. When the mixture is hot, add the clams and the bacon bits and cook for another 5 minutes without boiling. Season with kosher salt and pepper, to taste. Serve immediately, putting a pat of butter on the top of each bowl of chowder w/ a small piece of bacon and a sprinkling of paprika to garnish. Don’t forget the chowder crackers! Enjoy! healthier and giving it yet another dimension? it again I will suggest we make it a day or two before actually serving it. or curls, if desired, could also add to its look and flavor. Heat the oil in a large (6-plus quart) stockpot or dutch oven over medium heat. Add the leek and potato and kale . Cook, stirring occasionally, until the vegetables have begun to soften and brown slightly, about 8 to 12 minutes (this time will vary greatly depending on the surface area of the bottom of your pot). Add the vegetable stock and bay leaves, and bring to a boil. Reduce the heat to low, and simmer for 30 to 40 minutes, or until the vegetables are tender. Add the cream, and season to taste with salt (I start with 1 teaspoon and go from there, tasting frequently) and lemon juice and freshly ground pepper to taste. Ladle into bowls, and garnish with a dollop of sour cream and a healthy sprinkling of kale or bacon bits. As we head into the cold, long days of winter, I find myself craving comfort food that warms every part of you. A bowl of steaming stew, perfect buttery mashed potatoes or even a simple bowl of spaghetti Bolognese can fill the bill on any particular day. I found lamb shanks on sale at the store this week and was delighted to pair them with this ossobuco style recipe for the ultimate comfort food. Usually made with veal, lamb is a nice change and the succulent meat falls off the bone when made overnight in your slow cooker. The word literally means hollow-bone and refers to the middle part of the hind shank, which has tender meat around the marrowbone. Served with risotto or polenta, ossobuco makes a delicious and satisfying meal. Cut through the tendon that connects the meat to the bone at the bottom of the shank -this will allow the meat to bunch up nicely. Season the shanks generously with salt and pepper. Heat a large frying cast iron skillet or heavy fry pan over high heat. Add 2 tablespoons of olive oil, and brown the shanks a couple at a time, turning until dark brown all over (browning creates a great depth of flavor you get once they’re cooked). Set the shanks aside in a slow cooker. Reduce the heat to medium and add the 3 Tbsp. olive oil, butter, onions, carrot, celery and garlic to the same frying pan. Cook, stirring, for 10 minutes until the vegetables are golden and soft. Turn up the heat to high, add the wine, bring to a rapid simmer and let it bubble for 30 seconds or so to burn off the alcohol. Add the tomato paste, thyme, rosemary, stock, tomatoes, bay leaves and sugar to the pan and stir to combine. Pour or spoon carefully over the shanks. Cover with the lid and cook in the slow cooker on low for 6 hrs., spooning liquid over the shanks every now and then. The meat should be almost falling off the bone by the end. Gently remove the shanks using tongs or a large spoon (careful as they will be very delicate) and set aside in a dish covered in foil. Put the cooking into a large saucepan, add the butter to the sauce and boil for about 10 minutes to reduce slightly, or until it’ a nice pouring sauce. You may need to add 2-3 tsp cornstarch mixed with 1/4 cup cold water to thicken it up. Season to taste with salt and cracked pepper. Serve the shanks over creamy mashed potatoes, polenta or risotto alongside steamed green vegetables. Pour the sauce generously over the top. Sprinkle with parsley and lemon zest if you like. Andiamo mangiare! Last week we started “putting the gardens to bed” for the season. Cut up tomatoes and simmer with olive oil, onion salt, oregano and sugar until reduced to 1 cup or 8 ounces of sauce. Can be done while preparing cabbage. Leave cabbage whole, but cut around the stem, and parboil for 5 minutes; let steep for another 5 minutes. Remove cabbage from water and drain; separate cabbage leaves. Chop the small inside leaves and the core and use to line a Dutch oven. Combine all the stuffing ingredients and mix thoroughly. Season with salt and pepper to taste. Place 1 tablespoon stuffing on each of the larger cabbage leaves, fold ends of leaves over the stuffing, and roll leaves. Arrange the stuffed cabbage leaves in rows in Dutch oven; sprinkle each layer with olive oil, tomato sauce, and crushed bay leaf. Sprinkle lightly with salt and pepper; add remaining tomato sauce, beef broth and enough water to cover. Place a plate on top of cabbage rolls, and simmer over low heat for 1 hour. Serve the cabbage rolls with the pot sauce pored over them.